There is a vast market of hyper-intelligent phones, aptly named “smartphones.” They have truly earned their names; each individual phone has capabilities comparable to that of a computer. However, innovations within the smartphone industry has introduced issues elsewhere. Continuous improvements to smartphones poses a threat to TV viewership. The primary reason the TV industry is threatened by smartphones is because they have access to apps such as Instagram, Snapchat, Twitter, Periscope and other live streaming networks. These social media sites are attracting more fans for the consumption of sports. Overall, the smartphone is becoming the next modern day television and causing TV viewership to decrease. According to the online smartphone profile provided by SBRnet, 70 percent of smartphone owners use their smartphones for sports consumption. (1) This statistic is evidence of an increase of smartphone use. It is also evidence of a rapid decrease in TV viewership. According to Shalini Ramachandran, a Wall Street Journal reporter, online video streaming is up 60 percent while viewership of traditional television dropped 4 percent in the last quarter. 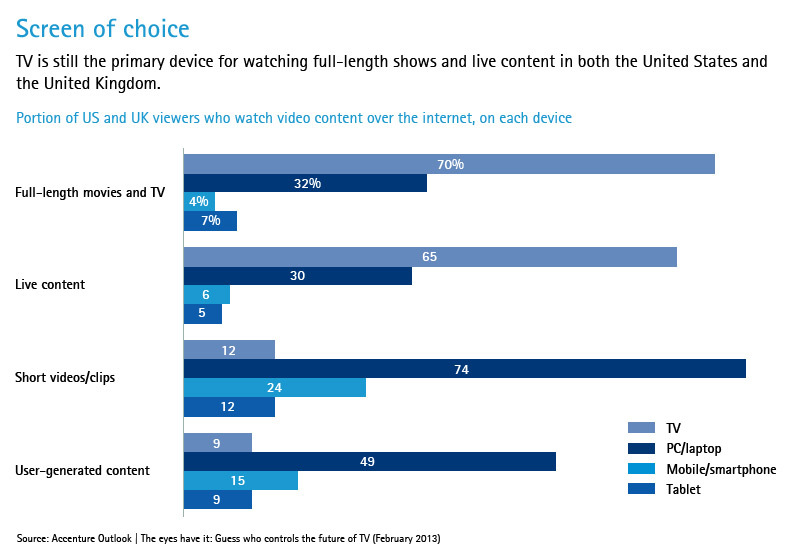 (2) What makes the smartphone so much more attractive than traditional TV? There seem to be multiple reasons why the smartphone is more appealing than traditional television. The three reasons I think are the most relevant are the short video clips, mobility, and multitasking. While TV usually shows the whole game and every play that happens during the game, social media displays only the highlights of each game. People are more interested in watching short clips instead of whole games. According to the graph presented by Accenture, people are likely to consume short-clips of the game highlights rather than the highlights on television (3). This could be the case because most sport fans do not have time to consume entire games because of prior engagements and such. However, every game has awesome highlights that are bound to be discussed and with the short video clips available on social media, the fans that did not see the game have the opportunity to catch the great moments on their smartphones without watching the game on a traditional television station. As a result, fans have the ability to experience the game without being forced to commit to watching the game. This explains why smartphones have become increasingly popular globally. The ability to move around while you are consuming sports plays a huge factor to why people prefer to watch sports on their phones rather than television. Some industries say that TV will never take the backseat to mobile/smartphones---they could be wrong! “Mobile will eventually become the predominant screen,” predicted Bob Dorfman, creative director at Baker Street Advertising in San Francisco. “I’d say within 10 years. (4)” Let’s take ESPN, the leading televised network for sports news coverage, for example. This past April, the cable network revealed that the majority of consumers of its digital video content tuned in via smartphones and tablets, reaching a peak of 57 percent in last August. These findings demonstrate why ESPN seeks to engage their audience with apps and other mobile news that are on smartphones/tablets. The ability to perform multiple tasks while watching sports seems to be very attractive to fans. Even though it’s scientifically proven that multi-tasking makes people less productive, it does not stop people from doing it. Physically, fans can watch games on their phones while doing chores at home; however, the multi-tasking capabilities don’t stop there. In a technical sense, smartphone users can multi-task using multi windows on their device. They can talk with a person on the phone, text, and view other things while simultaneously watching the game. Having this capability raises the incentive for smartphones users to watch sports on their phone as compared to the traditional television. Innovation in smartphones causes users to move away from traditional TV viewership, and if professional sport networks do not recognize this trend, revenue will continue to plummet. If this trend continues, the smartphone will become the next television. In order to continue to increase revenue, sporting networks have to continue to accommodate to the consumer demand by using apps and other mobile methods to display news. This blog post was written by Samford University sports marketing student Micah Green-Holloway.